Roula Pollard: Lela, you are a writer of children's books. How did the memories and experiences from your childhood and the environment you grew up in affect your writing? 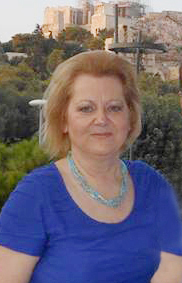 Lela Manganaris: I grew up in Voula, a suburb of Athens, in a very friendly environment, with sensitive parents and animal companions like kittens, puppies and chickens which we never ate. Even at pre-school age, I especially loved Greek mythology and traditional stories which were read to my sister and me by my mother. We developed the habit of changing the end of the story because it was usually very unhappy and instead we developed compassion. A landmark book for me was Viktor Hugo's "The Wretches" because of the transformation of one man’s attitude towards another. When Giannis Agiannis stole some bread and then beat the priest, he told the police officers who arrested him that the priest gave the bread to him. Love, forgiveness and acceptance changed this unfortunate man, who had spent his life in jail for stealing a piece of bread and transformed him into another man, becoming a mayor and helping the world. That's why almost all the stories I write are true to my childhood experiences. Roula Pollard: You are the co-author of the book "The Great Travel of Siddhartha" which became a best seller and a celebrated advance in contemporary Greek Literature. What events influenced the writing of this book? Lela Manganaris: This book was successful because it covered a gap in children's literature about Buddha's life and work. From the age of twenty, I wanted to read the life of Siddhartha in Greek because he has so much to teach us and we need to escape from the misconception that Buddha is a fat, vulgar loser in the world. Buddhism and ancient Greek philosophy have so much in common. Roula Pollard: The versatility and lyricism of your writing allows the reader to experience this book as a cinematic script, sometimes as his/her own personal experience. How did you accomplish this bold form of writing? Lela Manganaris: The intention was that the reader could read the book and understand the truth which governs Buddhism. And which we have personally experienced and that is why, through the diversity and lyricism of our writing, we can sometimes be identified and sometimes watch it, as a cinema script. Roula Pollard: It is amazing, how you and your co-writer Eleni Yiouni- Vassiliou, have had such a coordinated way of thinking and writing? Lela Manganaris: The coordinated way of thinking and writing that characterizes us as writers is the result of long-term friendship, spiritual communication and love we have developed over the years. Roula Pollard: The "The Great Journey of Siddhartha", a book for readers of all ages, attracted an audience of about 400 people when it was launched in Athens. How do you justify this large audience? Lela Manganaris: The high attendance was due not just to the effort of the publisher, but because the book is addressed to all ages and because Buddhism as a religion and philosophy, is attracting more and more interest in Greece. Roula Pollard: You are known to the Greek reading public as a writer of children's book . Tell me what has led you to write ten children's books so far. Roula Pollard: I was the first writer to review your children's books . How did you create this new concept, of abolishing the traditional ideas of good and bad in children's books? Lela Manganaris: First of all, a huge thank you for the valuable help and advice you have given me over the years. You are right, I abolished the ideas of good and evil because I believe that life is about encouraging the positive, the promises of brightness, light and purity. These values ​​originate from my Buddhist upbringing, my way of life and my peaceful spiritual balance. Roula Pollard: What inspired you to write the book about the island of Santorini and what environmental impact did this book have in Greece? Lela Manganaris: The unfortunate event of the sinking of the cruise ship SEA DIAMOND, in the Caldera bay of Santorini, eleven years ago, prompted me to write the book about Santorini. I felt as if I were the only person responsible for protecting the sea from pollution. As an environmental activist, I wanted to send a message to Greek people and to remind them constantly that the environmental consequences of the wrecked vessel are permanent. Roula Pollard: Caring for people, love for humanity and nature captivates the readers of your books. What role have your friends played in shaping the characters in your books? Lela Manganaris: I was lucky because my parents were nature lovers long before the environmental pollution was known; my participation in international social liberal movements and my encounter with good and extraordinary people, as well as my spiritual search and contact with enlightened teachers of Tibetan Buddhism, all these stimuli shaped the characters of my books. Roula Pollard: To what extent did meditation help you write so many books in such a short time? Lela Manganaris: Meditation helped me to find spiritual peace in quite adverse conditions and contributed to my spiritual empowerment and inspiration. Thus becoming aware, I became motivated to be creative and to write books beneficial to people of all ages.